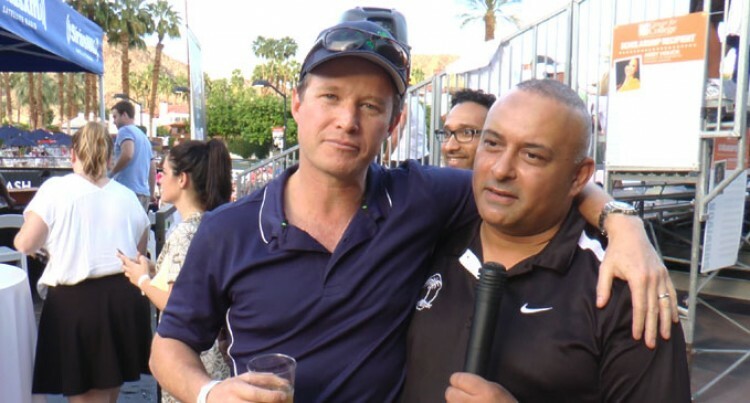 Ajay Bhai Amrit (right), with Billy Bush. Billy Bush is a household name right across America as the man who hosts the famous Television show “Access Hollywood”. This show is a very popular entertainment show and is in its 11th year on prime time TV. The name Billy Bush is not only famous in the television world, but also in another world where his cousin and uncle are very influential people indeed. Billy’s first cousin is none other than the former 43rd American President George W Bush, who served as President of this superpower for eight years. His uncle is 41st President of the United States of America George H W Bush, who served eight years as the head of the nation and also the chief of the C.I.A. before assenting to the Presidency. Impressive credentials indeed for Billy to put on his CV. Billy could have pursued politics and would have had a very easy entry into this arena, but opted for the entertainment industry and today has access to every Hollywood star in the business. Having the surname Bush has never hurt him in the industry and has opened many doors for him as he continues to become one of the best known personalities on the small screen of Television. Billy Bush was born in October 1971 to mother Josephine Bush and Jonathan Bush who is the younger brother of the 41st President of the United States of America George H W Bush. Billy attended the prestigious St George School in Rhode Island, New York, before joining Colby College where he graduated with a Bachelor of Arts in International Studies and Government. This degree was specifically designed for persons wanting to take office in Government and would have suited Billy perfectly if he wanted to go into politics or government affairs. After leaving college Billy decided to try his luck as a radio host in Washington close to his uncle and cousin and found that he enjoyed his job immensely. This was followed by a turn in direction to television where he was given the appointment as host of the popular game show “Let’s Make a Deal”. The following year in 2004 Billy became anchor for the hit entertainment show “Access Hollywood” where he was launched into instant fame. Working at “Access Hollywood” certainly has its advantages where Billy takes centre stage on the red carpet for award nights like The Golden Globes, Academy Awards, the Olympic Games etc. Billy has hosted the Miss Universe Beauty Pageant on four different occasions. He has hosted the Miss USA Beauty pageant four times and says that hosting beauty pageants is an amazing experience and cannot believe he gets paid so well to do such a job. Away from the spotlight he is married to wife Sydney Davies for over 17 years and they have three daughters named Josephine, Mary and Lillie and one son named Bradley. Having a large family with four kids is Billy’s greatest joy and doing a job he loves is just an extra bonus. With fame and fortune also comes responsibility and Billy is a proud Ambassador for Operation Smile, which carries out operations for children who have facial disfigurement and cleft and palate issues. To date the organisation has carried out a staggering 3.5 million comprehensive patient evaluations and of that number have managed to give free surgery to over 200,000 children making a significant difference to there lives. Regardless of Billy Bush having such globally influential family members he has never taken a job without feeling he has been awarded it on merit. He is proud of his family’s achievements on the world stage, but feels that this career path is his calling and he would never swap it even for a job at the White House.